Thanks to Rob Woodruff for sending out these reports on a regular basis. Lake Fork– The topwater bite has been consistent early and late and on cloudy days. The lake is a little less than 4 feet low, so wind quickly muddies the water on the downwind side. It is necessary to move around the lake to locate clearer water on a daily basis. Because of sparse weed growth, fishing very close to woody cover has been critical this year. The ability to make accurate casts that bring the fly within one foot or less of the timber has often made the difference between a slow and a good day. Bream are beginning to bed and Shad are spawning, so locating either will quickly produce some nice Bass. Lilly Pad fields are starting to produce on frog type flies. Smaller East Texas Lakes– With the last week’s full moon the Bream have begun bedding on Lake Quitman, Winnsboro, Hawkins and Gilmer. These lakes also offer great Bass fishing as well. Look for bedding activity on sandy points and the backs of creeks and coves. Poppers and slow sinking flies will produce almost constant action and a larger fly fished on the deep water side of the beds will draw the attention of Bass and Bowfin that are hanging around looking for an easy meal. Zone 1– Recent heavy rains have raised the level of Broken Bow Lake. Release from the Spillway is at approximately 110 c.f.s. and the creek and river are stained. Best flies have been Pheasant Tail Nymphs, Olive Caddis Larvae, Soft Hackles and Egg Patterns. Dry flies like Stimulators, Doculators and Crackle Backs are starting to draw strikes in Spillway Creek and the Evening Hole. The 13 Year Brood of Periodical Cicadas is hatching in Southeastern Oklahoma. Just as when the water was lower and clearer than normal in February, I am hearing from people that are having difficulty catching Trout in the higher stained water and asking what flies they should be using. Usually the key to catching fish in changing conditions is not to make drastic changes in fly selection but to adjust the leader, tippet, shot, etc., and the presentation in order to get the flies in front of the Trout. Recognizing the conditions, reading the water and making the necessary adjustments is the heart of the Trout Lab class Doc Thompson and I teach every year. Details on the upcoming 2011 class are below. Zone 2 & 3– Generation has been constant for several weeks. In the next few days, the generation schedule may be reduced for a while to help reduce flooding along the Lower Red River in Louisiana. There are a few spaces open for this year’s class. This will be the only Trout Lab offered in 2011. Registration deadline is Tuesday, May 31. The objective of the class is to teach fly fishers to analyze the natural variables presented in the course of a typical day on the water and to adjust fly presentation and tactics in order to maximize success. The Cimarron River and the towering Sangre de Christo Mountains provide the perfect venue for this class. Early June is a great time to fish the Cimarron and the lower section of the Rio Costilla. Loop Lab 201; Advanced Fly Casts and Presentations. On Saturday, September 24, 2011, FFF Master Casting Instructor Steve Hollensed and I will be conducting Loop Lab 201 near Lake Ray Roberts. 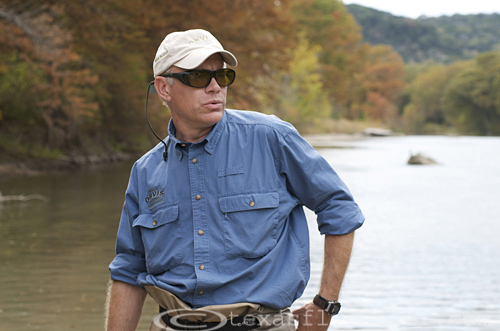 The class will address advanced topics in fly casting. Curriculum includes double hauling, distance and accuracy. We will also cover casting and presentation skills specific to warmwater, coldwater, and saltwater fisheries. Class is limited to 10 students and the class is already beginning to fill. If interested, contact Steve or me for details. Tuition: $200, advance registration required. « You Want Feathers? You Got ’em!